Over the past few weeks I have started looking at social media and social interactions in a different light and already have found myself being more critical of its uses, Because of this, in theory, I will perhaps look at changing the way I approach the use of social media going forward. This image is good for two reasons; one because I just said “in theory” and two because the subject explored this week is China – namely how the Chinese communist party controls censorship in the social media age. 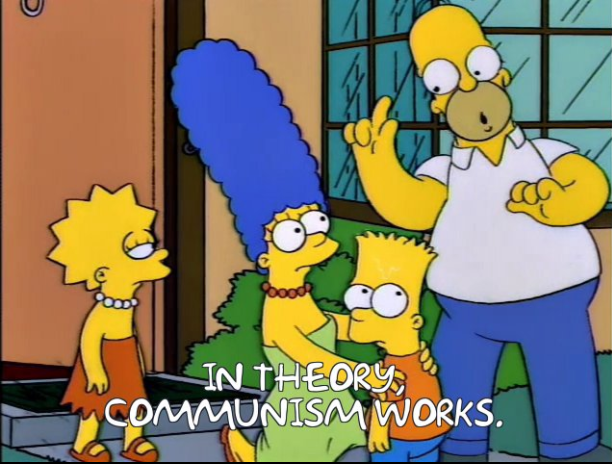 As far as the ideologies go I’m with Homer on this one. If executed correctly communism could be the best thing that ever happened to the world. The problem is the natural human instincts of greed and power – but these are topics of discussion for another day. With regards to internet censorship, specifically social media, the Chinese government – much like some of their counterparts in the middle east and South America – have used their iron rule to not only censor popular western destinations like Facebook but they have avoided revolt and dissent amongst their people by appeasing them with virtually identically functioning homegrown products to fill the void. Giving the people what they want, keeping them happy, and keeping them thoroughly pinned down inside the four walls of the glorious regime. Amazingly there are roughly half a billion people using Chinese social media at any given time – that’s 1/15th of the worlds population (approximately). China isn’t the only nation that censors what it’s people can see, ironically just about every ‘free’ western country has measures in place to chop and change what we see daily – the difference being that they don’t restrict things entirely. Strategic advertising and product placement is just as much apart of internet censorship in Australia as the blockage of Twitter is in China. Chinese people may not have ‘Google’ as we know it but they can probably make a search without their information being sold on to third parties to allow for geotagged results using their location to try and cater to them. From the outside we talk about this censorship and interference it would be interesting to see if the Chinese onine experience is more authentic than our own given that the content they have available to them has not been tainted. Ultimately, as with most pseudo-politcal debates, the topic of censorship is always going to be subjective. What one person feels is an invasion of privacy another may see as a necessity to ensure intellectual and civil freedoms are upheld. Regardless of who is right or wrong the most important thing to remember is that someone, somewhere is watching you. To whoever that may be in this instance leave me a comment, yeah?